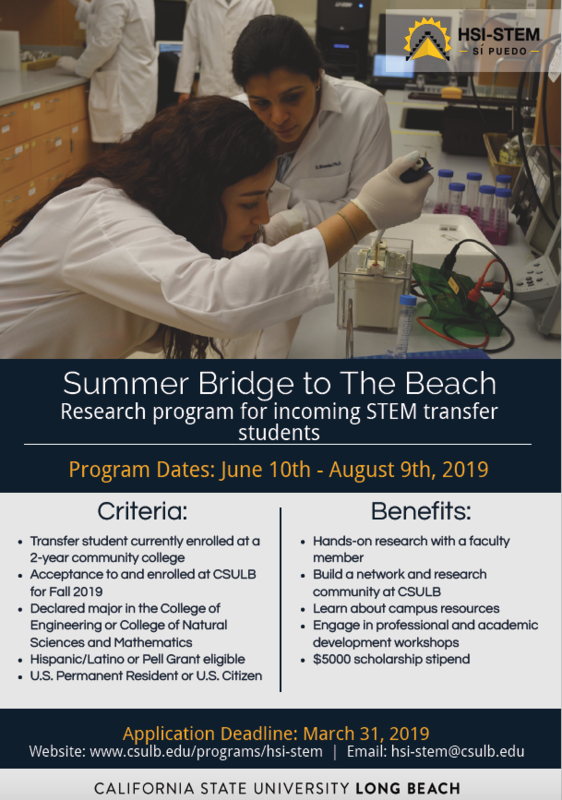 Summer Bridge to The Beach is a 9-week program for incoming Latino and Pell Grant eligible STEM transfer students. In this program, you will attend a one week orientation that includes: a brief introduction to the CSULB campus and student services, research focused trainings (such as lab safety and ethical conduct), and other academic and professional development opportunities. You will be required to attend weekly brown bag meetings throughout the 8 weeks of the program to further connect you and facilitate your transition to the campus. At the conclusion of 8 weeks, you are invited to attend a recognition event where you will give a presentation on your research and experience. 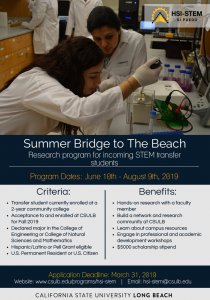 The goal of the program is to provide you with an understanding and appreciation for research, while facilitating your transition to the CSULB campus. View our cohort of Summer Bridge to The Beach students. View highlights from our previous Summer Bridge to The Beach. Committed to participate in an EXCEL learning community during the Fall semester following program participation. Requires enrollment in a one unit course. One (1) recommendation form from a professor, lab instructor, or STEM program director. Recommendation must be submitted directly to hsi-stem@csulb.edu by the deadline. "Learned how to be a better programmer and researcher, algorithm design, optimal path planning, and the work-flow of a professional in the field." "This program positively changed my life. It cemented my career choice and made me realize that I love science even more than I already did. I look forward to joining the beach in fall and becoming part of the community." "My mentor exceeded my expectations. [He] was really great at helping me throughout my research. He let me work on my own and make the mistakes necessary to grow in the field of research. He was quite exceptional." "My mentor was very knowledgeable about his field. He offered great career advice, and he recommended graduate programs which have never crossed my mind. He was inspirational, and he encouraged me to pursue higher education." "I am more confident in my ability to become a scientist. I have learned more about what it takes to become a scientist." "I have enjoyed being part of my lab. My mentor and peers have been approachable when I needed help with my project. It feels as if I am actually doing some ground breaking research. The HSI-Stem peers and coordinators have been friendly which has made this a very fun experience."